Kunio Murai was a struggling farmer from the wrong side of the tracks when he was recruited to work as a day laborer in a nuclear power plant near this farm town. The pay was triple what he could make anywhere else, and he was told that the work would be janitorial. One day in 1970, he and a co-worker were ordered into a room to mop up a leak of radioactive cooling water. They wore ordinary rubber gloves, but no masks or additional protection. Murai recalls wrapping a cleaning cloth around a pipe that was spewing steam. They worked for two hours, and afterward the needle on Murai’s radiation meter pointed off the scale. “I thought it was broken,” Murai said. It wasn’t. Within six months, he said, his joints swelled painfully and his teeth and hair fell out. Murai is one of tens of thousands of people who have worked over the years as subcontractors in Japanese nuclear power plants, doing the dirty, difficult and potentially dangerous jobs shunned by regular employees. In the wake of Japan’s worst nuclear accident, a nuclear fission reaction Sept. 30  at a uranium processing plant in Tokaimura, ugly allegations have surfaced of labor abuses, lackadaisical attitudes toward safety, inadequate worker training and lax enforcement by regulators in the country’s nuclear industry. Workers at the JCO Co. plant in Tokaimura, about 80 miles northeast of Tokyo, were mixing uranium by hand in stainless steel buckets to save time. The ensuing nuclear reaction exposed as many as 150 people to radiation, according to the final report issued this month by Japan’s Nuclear Safety Commission. 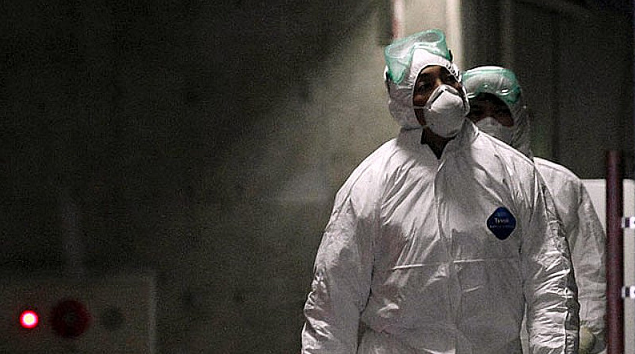 One worker died from a lethal dose of radiation, and another remains hospitalized. Keep in mind this story was published in 1999, when Japan’s “worst nuclear accident” exposed 150 people to radiation. How far we have come…. From his hospital bed, at least one worker, a regular employee who was supposed to have undergone safety training, told investigators he had no idea that what he was doing was dangerous. But plant officials later admitted that they did know–and had created an illegal operations manual ordering the hand-mixing to save time and money. The revelations shocked the public but did not surprise Murai, who tells horrifying tales of his brief stint in the Tsuruga nuclear power plant. And it did not surprise anti-nuclear activists, who allege that several thousand day laborers–no one knows exactly how many–continue to be recruited each year by the small subcontractors that supply manual labor for nuclear power plants. Some allegedly are hired by shady labor brokers who drive trucks to the skid rows of Tokyo, Yokohama and Osaka, offering $100 for a day’s work. The takers are drifters, the down-and-out, or foreigners willing to do whatever it takes to earn quick yen. Government and union officials say they have no knowledge of such goings-on. They insist that Japan’s nuclear power plants are clean, safe and well regulated. But public trust in such statements had begun to erode even before the accident. Five nuclear-related accidents and mishaps and several failed cover-ups have occurred since 1995. Again, remember—this would be just between 1995 and 1999, when this article appeared. And officials concede that supervision has been inadequate at nuclear facilities other than power plants, such as fuel reprocessing plants and laboratories. Those facilities were presumed to be safe before the Tokaimura accident. After the accident, Prime Minister Keizo Obuchi ordered an inspection of all such facilities, and the results made fresh and frightening headlines: 25 serious violations were found at nine locations. Lapses included improper handling of radioactive material and failure to conduct proper safety training, perform required medical checkups and report radiation exposure. The Nuclear Safety Commission later recommended that Japan abandon its long-held attitude that nuclear power is “absolutely safe” and take stringent measures to prevent future accidents. But activists also want the government to investigate the system of subcontracting for manual labor in nuclear power facilities–a system that they allege is discriminatory and dangerous. You will note from our other piece that the subcontracting system has remained the norm. The elite engineers and highly skilled unionized workers at the top of the labor pyramid, who work for the blue-chip giants that build and operate Japanese nuclear power plants, are carefully monitored and protected from radiation exposure. However, the majority of nuclear plant workers are employed by subcontractors or their subcontractors, an arrangement that allows big corporations to avoid major layoffs of their own people in hard times. Critics say this system diffuses accountability, makes it impossible to keep tabs on the health of workers and places responsibility for safety with smaller, less visible and financially weaker companies. The workers at the bottom of the socioeconomic food chain–including those allegedly hired by the day from skid rows–receive the least safety education and the highest radiation doses. According to data from Japan’s Nuclear Safety Commission, of the 71,376 Japanese who are employed in the nuclear power industry, 63,420, or almost 89%, work for subcontractors. It is these employees who receive more than 90% of all radiation exposure. Moreover, the casual laborers included among those subcontractor employees have scant legal protection, activists charge. And historically, they have received little or no compensation when accidents or illnesses occur. “Nuclear labor in Japan is a human rights problem,” charged photojournalist and author Kenji Higuchi, a nuclear foe who has spent 27 years documenting alleged safety abuses. “The whole system is based on discrimination. There are a lot of people right now who are doing the same jobs as Murai-san did. “When you go inside a nuclear power plant, it means you are going to be exposed to radiation,” he said. “You are paid to be exposed.”…. …Murai’s story about life at the bottom of the nuclear labor pyramid shed an eerie light on industry practices that are under fresh scrutiny since the Tokaimura incident. He recalls taking part in what amounted to radiation relay races. One by one, workers would run into a “hot” room for just five or six seconds each, turn a screw or perform another brief task and then rush back out, he said. A plant employee armed with a clipboard and a whistle made sure no one stayed in too long. Workers were supposed to dispose of the rubber gloves used while cleaning up radiation but thought that a terrible waste. They sneaked the gloves home for their wives to use when washing dishes or working in the fields, Murai said. Others say overall safety standards have improved–but someone still has to do the radioactive dirty work. Murai, a burakumin, or descendant of the outcast class in Japan, said these days the hired hands in nuclear power plants are no longer farmers. Rather, he said, they include Koreans–some of whom reportedly lack proper visas and thus are in no position to quit or complain–along with Brazilian immigrants of Japanese ancestry and others living on the economic margins. …In an unusually combative question-and-answer session in parliament in October, Okazaki grilled a Labor Ministry official about allegations made by former power plant worker Norio Hirai, who died of lung cancer in 1996. Hirai was an engineer for a subcontractor who went inside reactors to supervise his workers. Before he died, Hirai alleged that nuclear plant workers slept through their required safety training videos; that many were so uneducated that they stripped off their masks or other protective gear when working in the fierce heat of the reactors; and that nuclear gypsies and men who already have had children were routinely given the most dangerous jobs. The debate is not just about safety but also about the degree to which regulators have allowed the nuclear industry to operate on what amounts to the honor system. Regulators hadn’t set foot inside the uranium processing plant in Tokaimura in 10 years…. That was the view a little over a decade ago. How much have things improved, one wonders?